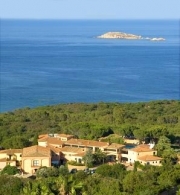 The Hotel le Ginestre is located in north-eastern coast of Sardinia, in one of the most exclusive areas of the Costa Smeralda, a few hundred meters from the center of Porto Cervo. The Hotel is at 30Km distance from Olbia Airport “ Costa Smeralda ” and The Port of Olbia Isola Bianca. The “Costa Smeralda “ that most evocative, inimitable corner of the Mediterranean, is a perfect melange of wild and beautiful countryside with elegant, refined buildings. L’Hotel Le Ginestre stands in an oasis of natural beauty and jealously guarded privacy looking out over the splendid Golf of Pevero. The Hotel, set in a magnificent, typically Mediterranean park, has a particular architectural quality which blends perfectly with the countryside. An American Bar which gives onto the fresh water swimming pool with its comfortable “Gazebo’’ that offers at extra hours food facilities. A restaurant which is highly appreciated for its local and international cuisine. Leave Olbia heading north on the SS125 following the sign for Arzachena/Costa Smeralda continue along this road and after approx 8 km you come to a roundabout take the first exit (right) SP73. Continue along this road for approx 7 km you will see a sign for Porto Cervo-Abbiadori turn left. Continue along this road for approx 3,5 km and you will come to the Hotel Le Ginestre on your right.